The arrow above is placed on "Christian Hollow Road" & is pointing back to Crosby. The crossover road in the foreground is the road to White Hollow. 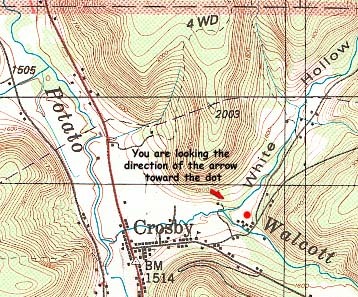 The sawmill shown above was located at the convulence of Walcott Brook and White Hollow, just east of Crosby as shown on the map below. This plant was owned and operated by Nicholas Heinemann. Heinemann was born in 1848 in Germany. His family moved to the United States three years later and settled about a mile south of Colegrove. His father bought a farm and an up-and down sawmill. Nicholas worked for him and eventually took over the business. He moved and enlarged the mill closer to his homestead, now rebuilt as the Maples Inn. By 1890 he was cutting 30,000 feet a day. In the spring of 1891 Heinemann and his partner, Clinton Comes, built a three foot tram road up Colegrove Brook. He continued buying only timber until January 1893 when he bought a warrant of land drained by Taylor Field Branch of Colegrove. Most of his best saw timber was located along Colegrove Brook and its tributaries. 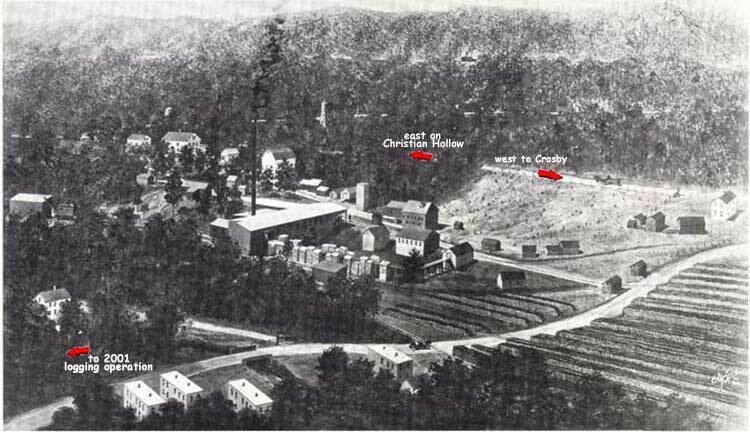 Herbert Rich sold him 4831 acres for $4831 of cutover land which had a considerable amount of chemical wood (wood under eight inches in diameter). retorts and was also sold to the glass plants at Hazelhurst and Mt. Jewett. Today these fields are owned by the North Penn Gas Company. The sawmill continued below Colegrove until late 1905 when the machinery was moved to Crosby. The old mill remained standing at Colegrove for many years. The new mill was small, the majority of Heinemann's good saw timber having been cut by then.